The return of three key players from injury has prompted Bulls coach Frans Ludeke to re-jig his Super Rugby side to face the Hurricanes in Pretoria on Saturday. 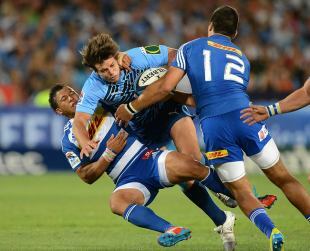 Fullback Jurgen Visser, inside centre Wynand Oliver and flanker Deon Stegmann have recovered from respective ankle, knee and rib injuries. Fullback Ulrich Beyers and midfield back Jan Serfontein have both been dropped from the Bulls 22 that defeated New South Wales in Super Rugby round 11, while openside flanker Arno Botha is demoted to the reserve bench. Ludeke said his fourth-placed team, coming off a 30-19 home defeat of New South Wales Waratahs, must be wary of the ninth-placed Hurricanes. "They are a very dangerous side when there is broken field and open play, so we need to make sure we dominate territory and possession and win the gain line battle," he said. Bulls: Jurgen Visser; Akona Ndungane, JJ Engelbrecht, Wynand Olivier, Bjorn Basson; Morne Steyn, Jano Vermaak; Pierre Spies (captain), Dewald Potgieter, Deon Stegmann; Juandre Kruger, Flip van der Merwe; Werner Kruger, Chiliboy Ralepelle, Dean Greyling. Replacements: Willie Wepener, Frik Kirsten, Grant Hattingh, Arno Botha, Francois Hougaard, Louis Fouche, Lionel Mapoe.